I want your spool data! - Page 9 - Miata Turbo Forum - Boost cars, acquire cats. Downpipe Size/Style: BEGI custom divorced 2.25" or 2.5" ? Exhaust Components: FM hybrid cat (2.5" entrance, 3" rear), magnaflow rez, magnaflow 5x11x22"
Last edited by JasonC SBB; 01-06-2012 at 06:09 PM. Added my new data. 3rd earliest spool. PhilMD's data (2nd fastest) isn't at 4th gear on the street, it's on a dyno, which may produce a spoolier result. VVT head got me like 250 RPM of spool. ohhhh i need to find a boost log of my t3 50 trim chinacharger compared to my t3 60 trim. 1-1/2" tube, probably about 24" long before it merges back into the 3" downpipe. What wastegate doesn't require the exhaust to abruptly change directions? The wastegate itself is a 90 degree angle. Id try not doing that. VTA isn't really my thing. I have a .86 Tial housing on order, I will try that first. It should be a pretty easy swap, given all the v-band connections!! I hate to lose my 14 psi at 3150 rpm spool, but if it works it will be a helluva lot easier than going to a 44mm wastegate, or twin wastegates, or anything else that requires extensive welding and fabrication. Last edited by muoto; 06-15-2012 at 04:40 PM. wow that is an efficient setup right there. torque under curve must be insane. Got a dyno plot? There’s one in my build thread but my wastegate was leaking during that dyno run... nevertheless with 14.5psi boost it made 265lbs around 4K so I’m happy. I wanted to post my values before tuning my EBC. I'm honestly not very happy with the results. I expected to be at 20psi before 4k. I guess the smaller wheel of the 2860rs is offset by the .84 exhaust housing vs the .64 of the china 2870. Can we add another field to this survey? Altitude. I've been trying to research altitude vs spool loss and I haven't had much results. Soon enough I should have datalogs for where I live (7200 ft elevation) vs Albuquerque (5200 ft) - but I'm more curious of the differences between sea level vs 7k+ feet. ***Edit: I found a couple days after posting this data that my wastegate was loose...really loose. Retuning for what will hopefully be greatly improved spool and will post new results when I get them. Still working on the tune, but I don't think I'm going to get spool times down much more due to the crappy manifold and dp, no matter how much timing I throw at it. So here it is. 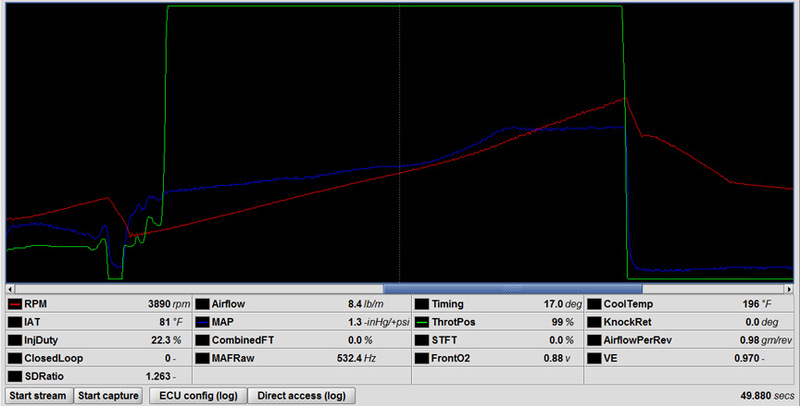 4th Gear Pull, flat footed it at about 2K rpms but I'm in vac until roughly 3400 so that's where the data starts here. Last edited by matthewdesigns; 06-22-2012 at 10:23 PM.